Some Mothers Do ‘Ave ‘Em is a British sitcom created and written by Raymond Allen. 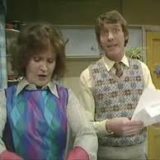 The show follows the hapless, accident-prone Frank Spencer and his tolerant and long-suffering wife, Betty. Frank’s various attempts to hold down a job always end in total disaster, much to the frustration of his wife, but Frank stills ploughs on optimistically. The sitcom was noted for its stuntwork, performed by Crawford himself, as well as featuring various well-remembered and much-lampooned catchphrases that have become part of popular culture. Some Mothers Do ‘Ave ‘Em came 22nd in a 2004 poll to find Britain’s Best Sitcom. Going on Holiday – Frank boards the train with Betty for his second honeymoon . At the hotel, things start to go really wrong when he tries to push the single beds together – eventually, the whole room is wrecked. Looking for replacements, he and Betty raid a neighboring room causing him to complain to the manager, Mr Bedford, about a haunting, presuming it’s his late grandpa. Men as Women – Frank proves a destructive streak doesn’t qualify for the demolition business, incurring a hearing impairment. Grandpa Spencer writes to announce his arrival in Britain. Dr. Mender is annoyed by Frank’s frequent pointless visits, this time a present for him as his birthday is the same as Jessica’s. Frank also sees him rehearse with another doctor for the hospital pantomime, but doesn’t get it. A fake alert for Jessica brings each doctor in turn, pressed for time to change from the stage costumes.